The Baluch people ar inhabiting the region of Baluchistan which consists of Pakistani Baluchistan, Iranian Baluchistan and the southern parts of Afghani Baluchistan (Afghanistan). The important Baluchi traditions are mainly in connection with their ceremonies and feasts. The marriage ceremony stands prominently among such festivities as it goes through different stages starting from engagement to the wedding ceremony. Public participation in the wedding ceremony is normal. Mangir is the cost saving ceremony for the simultaneous mass marriage of several couples among lower class people of the society. 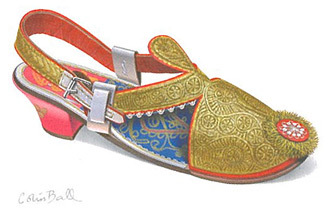 The bride's sandal shown here has gild wire embroidered, velvet covered leather upper with dripping pearl decoration.